ANA ended FY2017 ending March 31 2018 with record-high consolidated financial results with operating revenue of 1,917 billion JPY (+11.7% year on year), operating income of 164.5 billion JPY (+13%), ordinary income of 160.6 billion JPY (+14.4%) and net income attributable to owners of the parent of 143.8 billion JPY (+45.6%). ANA explained that the financial growth resulted from strong performance in international passenger and cargo services and the revenue from Peach Aviation Limited as a new subsidiary. The air transport business increased operating revenue by 12.6% to 1,731.1 billion JPY and operating income by 12.4% to 156.8 billion JPY. The travel business, however, reduced operating revenue by 1% to 159.2 billion JPY, and operating income was unchanged to 3.7 billion JPY. Revenue of the international passenger service was up 15.6% to 597.4 billion yen with a 6.8% increase in passengers (9,740,000 passengers) because ANA succeeded in capturing the strong business demand originating in Japan and the capture of robust inbound travel demand. ASK was up 7.0%, and RPK 7.7%. The load factor was 76.3%, higher than 75.8% in FY2016. 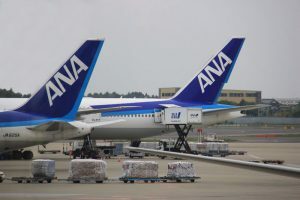 In terms of route network, ANA increased frequencies to double daily on the Haneda-Jakarta route in August and to triple daily on the Tokyo (Haneda and Narita)-Los Angeles routes in October. Revenue of the domestic passenger service was up 1.7% to 689.7 billion yen with a 2.8 increase in passengers (44,150,000 passengers). ASK was down 1.1%, but RPK was up 3.3%. The load factor was 68.9%, higher than 66.0% in FY2016. In FY2017, ANA started serving Chubu-Miyako route in June, operating late night flights (Galaxy Flights) on the Haneda-Okinawa route for a limited period in summer and increasing the number of late night flights on the Haneda-Hiroshima route.